In yeast, cell-size checkpoints coordinate cellular growth with cell-cycle progression. Now, evidence has been provided that such checkpoints probably do not exist in mammalian cells. These findings highlight an important difference between how yeast and animal cells proliferate in response to extracellular cues. Over the last few decades, studies in different model systems have allowed great progress to be made in deciphering the genetic networks that coordinate events such as cell-fate specification, cell differentiation, patterning and morphogenesis . But the regulation of animal size remains an area that is still somewhat poorly developed . The control of cell numbers and cell size appears to be the main mechanism by which metazoan organisms regulate their final size . Understanding how these processes are regulated and coordinated remains an important challenge. A great deal has been learnt about cell division and the regulation of cell-cycle progression. Beginning with some classic studies in yeast, the cell-cycle field has uncovered many of the key regulatory genes that control both DNA replication and mitosis . Numerous studies have emphasized that these cell-cycle mechanisms show a high degree of evolutionary conservation. But how are cell growth and cell size controlled? In culture, most cells generally double their mass before mitosis and maintain a fairly constant size over time. These observations have led to a fundamental question in cell biology: do cells monitor their size? If so, do any cell-size checkpoints operate to couple growth and the cell cycle and to prevent cell division before a certain size? In yeast, the answer seems clear: some kinds of cell-size control mechanisms do operate . These are responsive to extracellular nutrient availability and function to ensure that yeast cells enter either S phase of the cell cycle or mitosis only once a critical cell size has been obtained . Yeast have thus probably adapted to ensure that they appropriately modify their proliferation rates according to environmental conditions . Do such cell-size checkpoints also exist in animal cells? Surprisingly little work has focused on addressing this issue. The study of cell growth seems to have taken a back seat to the unraveling of cell-cycle controls in metazoans. Some early studies both supported and refuted the existence of size-control mechanisms in mammalian cells, however . It is this question of cell-size control that has been revisited by Conlon and Raff  in a paper appearing in this issue. Taking an approach that is far too seldom used in cell biology, they directly measured changes in cell size and cell-growth rates in response to extracellular factors. Using purified cultures of Schwann cells, Conlon and Raff  examined cells arrested in S phase using the DNA replication inhibitor aphidocolin. This allowed them to measure growth independent of cell-cycle progression. They found that growth rates were similar regardless of cell size: both large and small cells grew and increased their protein content at the same rate. Moreover, these growth rates were essentially linear over a period of up to nine days in culture, and were determined solely by the levels of extracellular growth factors. These findings contrast markedly with the behavior of proliferating yeast cells, where large cells have faster growth rates than small cells. Checkpoints are therefore required in yeast to ensure that cells divide at a critical size, thus maintaining a constant mean population size (Figure 1a). As Conlon and Raff  neatly point out, the occurence of linear growth rates, regardless of size, in mammalian cells would allow populations of cells to maintain a roughly constant mean size over time, in the absence of any need for specific cell-size controls. They further show that shifting proliferating cells between low-serum and high-serum media alters cell size slowly over a number of divisions. This again contrasts with the rapid (within one cell cycle) nutrient-dependent controls of cell size imposed in yeast. Together the findings of Conlon and Raff  present compelling evidence that strict cell-size controls, as observed in yeast, probably do not operate in mammalian cells. 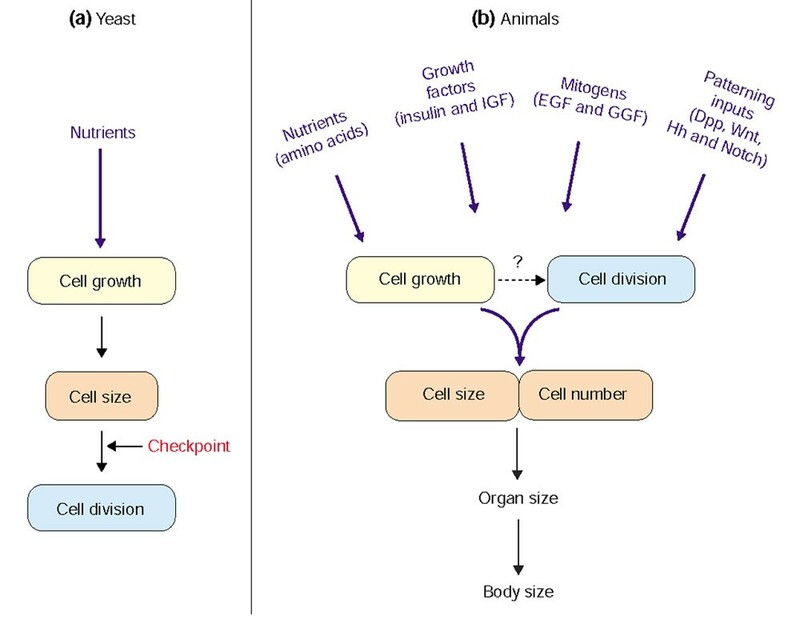 Yeast and animals cells control cell growth and division in different ways. In yeast, rates of cell growth are strictly controlled by nutrient availability. In nutrient-rich environments, growth rates are high and cells are large. In contrast, when nutrients are limiting, growth rates are slower and cells are smaller. Cell-size checkpoints function to ensure that yeast cells divide only at a critical size dictated by nutrient conditions; they therefore ensure that proliferation rates in yeast are appropriately tailored to environmental conditions. In animal development, cells are under the influence of a variety of extracellular stimuli such as nutrients, growth factors, mitogens and various patterning inputs, examples of which are shown. These signals mediate cell-to-cell communication and act to control both cell size and cell numbers, in order to ensure correct organ and organismal growth. Under these circumstances, strict cell-size checkpoints may not be necessary. Rather, overall proliferation is probably regulated by the independent but coordinated control of growth and division by diverse stimuli. The question of whether animal cells have cell-size controls can perhaps also be addressed by asking whether animal cells actually need cell-size controls. In unicellular organisms such as yeast, proliferation rates must be rapidly adapted to nutrient availability, making the coupling of growth to division a necessity for optimal fitness. In contrast, the goal of developmental programs in animals is to tailor proliferation rates so as to ensure appropriate organ and organismal growth. In this case, cell-to-cell signaling through extracellular factors, rather than nutrient availability, predominantly influences cell growth and division. As suggested by Conlon and Raff , for any given cell type these two processes may be under independent but coordinated control by distinct growth or mitogenic factors. For example, in a previous paper , they showed that in cultured Schwann cells, insulin-like growth factor (IGF) could preferentially stimulate growth whereas glial-growth factor (GGF) promoted cell division. These findings are reminiscent of earlier work by Zetterberg and colleagues  using NIH 3T3 cells to show that distinct growth factors could either stimulate growth or stimulate cell division . Furthermore, Conlon et al. demonstrated that when cell-growth rates were kept constant (by culturing cells in a fixed concentration of IGF), simply increasing the levels of GGF could increase cell-cycle progression and hence reduce cell size. Similarly, in the current article , when cells were cultured without passaging, levels of extracellular growth factors became limiting, thus decreasing growth rates. Because rates of cell division were unaltered, the mean population cell size slowly decreased. Thus, for proliferating animal cells it is the relative levels of these pro-growth and pro-division factors that probably determine cell size at division. It will be important in future to understand how the levels of such key factors are controlled and coordinated in animals. So, for developing animals, in the absence of any strict cell-size controls, spatial-patterning signals may ultimately act as the 'checkpoints' that control growth. Examples of this are seen in the developing Drosophila wing. When rates of either cell division or cell growth were experimentally altered in the posterior compartment of the wing imaginal disc, marked changes in cell size resulted. In each of these cases, however, patterning cues appeared to offset and 'correct' for any manipulation by altering cell numbers to maintain a constant organ size [9–11]. These findings suggest that patterning cues are somehow coupled to growth and the cell cycle. In fact, these signals may themselves directly act as growth factors or mitogens (Figure 1b). For example, in the Drosophila wing, the pattern-signaling proteins Decapentaplegic (Dpp) and Hedgehog (Hh) can control growth and division in a cell-autonomous manner [12, 13], in the latter case through increasing levels of the cell-cycle regulators cyclin D and cyclin E. Wingless and Notch, which act in pattern-determination, also act as important 'stop signals' to arrest the cell cycle and growth . Studies of the development of the mammalian central nervous system have also shown that homologous patterning molecules, such as Wnts and Sonic hedgehog, can act as mitogens and directly regulate components of the cell-growth and cell-division machinery such as cyclin D and the proto-oncogene product c-Myc [15–18]. Further in vivo studies will be crucial in examining how cell growth and division may be controlled by these kinds of developmentally regulated signals. One obvious question that stems from the findings of Conlon and Raff  is that if there are some extracellular factors that are pro-growth and some that are pro-cell division, how do they exert their effects? The field of cell-cycle research has not only identified numerous cell-cycle regulators but also begun to define mechanisms by which their activity may be controlled by intracellular signaling pathways (for some examples, see [19, 20]). These findings have provided a logical framework with which to begin identifying links between extracellular signals and the cell-cycle machinery. A trickier question concerns what cell growth really is and how it is controlled. A number of extracellular factors and intracellular signaling pathways have been identified that are dedicated to the control of cellular growth. Perhaps the best examples are the evolutionarily conserved insulin and phosphoinositide (PI3K) signaling pathway, and the nutrient-dependent signaling networks that include the protein kinase target of rapamycin (TOR) . We are still far from understanding the metabolic process that these pathways alter in order to regulate growth, however. One model that has been proposed is that protein-synthesis rates may be critical determinants of cell growth . In yeast, genes controlling ribosome biogenesis and protein translation have been identified as critical regulators of cell growth and cell size [23, 24]. Indeed, for yeast this mode of cell-growth control is thought to provide a mechanism to link growth to the cell cycle. For example, the translation of the mRNAs for key yeast cell-cycle regulators is critically dependent on ribosome numbers within a cell [25, 26]. These kinds of cell-cycle controls probably represent the molecular basis of the cell-size checkpoints described earlier. In metazoans, growth-stimulatory pathways such as those involving insulin/PI3K and TOR are known regulators of translation initiation and ribosome biogenesis . It is possible that, as in yeast, the levels of cell-cycle regulators may be under growth-dependent translational control . Although not acting as strict cell-size checkpoints, these mechanisms could allow for the coupling of growth signals to the cell-cycle machinery. More definitive studies are required, however, if we are to elucidate the role of these processes in the stimulation of growth. Alternate modes of growth control may also be important. For example, the controls of nutrient uptake and metabolism , and of nucleotide synthesis , and the regulation of mitochondrial function , could all be targets for growth regulatory pathways. It is likely that the basis of the growth response itself will vary depending on the inducing stimulus. Future studies must examine growth not simply as a quantitative phenomenon but rather as a process controlled through qualitatively different changes in cell metabolism.